Retrying will not change anything. This is a permanent problem with ClockworkMod recovery in conjunction with Android version in the new Defy. But it’s easy to solve. Defy+ is mostly a Defy with faster CPU and a bigger battery. This is why all the howtos and tutorials simply point to the older version. CyanogenMod itself provides one download for both versions. 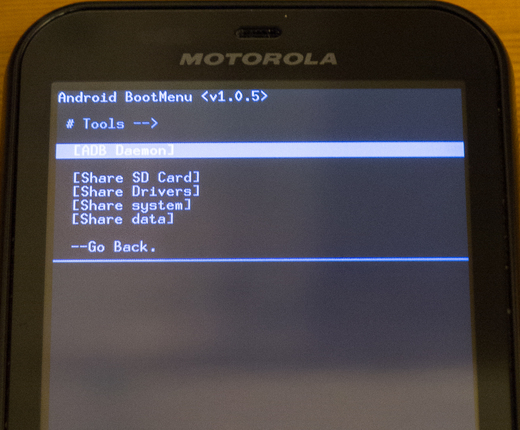 All this is good, but we can’t forget that the stock ROM contains a newer version of Android on the Plus version. The particular problem is that to make things faster, the /tmp directory in Defy+ is stored on a RAM disk. This is in fact a typical tmpfs created for some reason as /data/tmp. Then, the real /tmp is substituted with a symbolic link to /data/tmp. Not so surprising by today’s Linux standards. The problem: one of the first steps of ROM upgrade is to wipe the old /data. Then, everything Clockwork recovery does, goes through /tmp… Which is a link to something that you just erased. Great, isn’t it? That’s it. /tmp is an actual directory again, thus it can be used by Clockwork mod and everything is fine again. Can you write simple instruction how to install cyanogen on defy? I found few instructions about this, but none of them is clear for me. Can I back to original android version after all? Do you already have root? nope. and I actually have defy not defy+, but I think that the way of doing things is very similar. Performance of original software is really disappointing, but until I’m not sure how upgrade android correctly I do nothing. What is with guarantee? Can I back to original android version and pretend that I never messed with phone software? For the original Defy, the official steps should suffice. I didn’t read the warranty agreement myself, but from comments I deduced, that just getting root privileges voids the warranty. A full backup and restore is possible only after you get root. Thus, depending on your carefulness and inquisitiveness of Motorola folk you may or may not succeed with getting warranty repairs after modding the phone. Hi, I run the command line and write “adb shell” but PC say: error: device not found. What I have to do? Is it connected through USB? Have you set up the phone to allow debugging? Now I have it under Settings -> Applications -> Development -> USB debugging. Don’t really remember if it was like this in original ROM.